A star-studded premiere for Bollywood superstar Amitabh Bachchan's new film, The Last Lear, has been scrapped in Mumbai, India, because of security concerns for guests, after the Shiv Sena chief made threats against the Bachchan family. Mr. Bal Thackeray has vowed not to allow any film starring any member of the Bachchan family from being released in the state of Maharashtra of which Mumbai is the capital, according to media reports. Mr. Thackeray has rejected repeated apologies from Mr. and Mrs. Bachan over their reported remarks denigrating Marathi language. 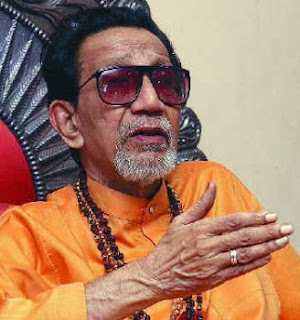 So who is Bal Thackeray and why is he so feared? According to a Wikipedia entry, Bal Keshav Thackeray (born January 23, 1926), popularly known as Balasaheb Thackeray, is the founder and chief of the Shiv Sena, a Hindu nationalist, Marathi ethnocentric and populist party active mainly in the western Indian state of Maharashtra. He is also referred to as Hindu Hridaysamrat (lit. "Ruler of Hindu hearts") and Sher (Tiger) by members of the Shiv Sena. Thackeray is very vocal in his opposition to people who migrate to Mumbai, to non-Hindus (especially Muslims), and to Bengali Muslims he believes are Bangladeshis. In the late 1970s, as part of his "Maharashtra is for Maharashtrians" campaign, Thackeray threatened migrants from South India with harm unless they left Mumbai. Shiv Sena party has politically allied itself with the Bhartiya Janata Party (BJP) and its Hindu nationalist agenda. Though currently out of power, Shiv Sena has dominated the Maharashtra legislature in the past. Indian Muslims have specially felt the wrath of Mr. Bal Thackeray's bigotry. He has called Muslims a cancer in India's body that must be surgically removed. He has also advocated the creation of "Hindu suicide squads" to fight the scourge of "Islamic terrorism." His party activists have vandalized cricket pitches in India, in protest against tours by the Pakistani cricket team. Mr Thackeray commands an almost fanatical following among his party members. People like Shiv Sena chief Thackeray, BJP leader L.K. Advani and Gujarat Chief Minister Narender Modi represent the ugly underbelly of Indian democracy and a great threat to India's secular constitution. Modi is currently in power in Gujarat, in spite of overwhelming evidence of his participation in 2002 anti-Muslim riots resulting in the massacre of thousands of Muslims. Mr. Advani has been held responsible for the destruction of Babri mosque and subsequent anti-Muslim riots. Mr. Thackeray is considered responsible for major anti-Muslim riots in Mumbai and continues to terrorize any one who disagrees with him. A rudimentary study of world history suggests that if the Indian political system can not find a way to marginalize and isolate Thackeray, Advani, Modi and other fanatics like them, India will continue to face threats to its secular constitution. Riaz, as an ex-citizen of Mumbai I can confirm the accuracy of your observations. But I suspect your opinion makes Thackeray more fearsome than he actually is. He's out of power and papering over a succession struggle that has split the party between his son, Uddhav, and his nephew, Raj. He might still pack some punch, but his bark is louder than his bite. His "Marathi Manus" (Maharashtrian Man) movement is bogus. He's only interested in Mumbai - where the money is. He has virtually no political base outside the city. His ire against Muslims is selective: pay him enough and he's your life-long friend. The Bohras and Khojas know this well. Bangladeshi migrants into Mumbai get the short end of the stick because they don't know his wacky "rules of engagement" or do not have the money. As for his idea of "Hindu suicide squads": that's more wishful thinking than anything else. Unless the India can find a way to put Thackeray, Advani, Modi and others like them out of business, India will continue to face threats to its secular constitution. Cannot agree that the consequences are that dire i.e. threat to the constitution itself. While there is no excusing what Modi did - state-sponsored murder - Advani and Thackeray's actions play to a small far-right-Hindu audience. The hope is there are sufficient checks and balances in the system to prevent it from keeling over to the right. There is evidence that there indeed is: the BJP, when in power, moderated its stance very significantly in order to get business done - got into serious ideological hot water with the RSS and VHP. They will sabre-rattle to get to the kursi - worked for them the last go-around. As for Modi, he will continue to be elected: his record as an administrator is so exceptional (in Gujarat, where the standards are high to begin with) its hard to tag even mass-murder onto him and bring him down. Chalk it down to a failure of the democratic system. Riaz, didn't check the facts. Looks like you got them wrong as well. It wasn't Bal Thackeray who threatened Bachchan, it was his renegade nephew Raj who did. Bal actually came out in favor or Bachchan the last time Raj was mouthing off. The same thing's likely going to happen now. Raj is the Mini-Me if Bal is the original Dr Evil. He's adopting the same silly tactics that Bal had success with in the '70s and '80s. They're terribly anachronistic now - wish Bachchan had stood up to him like he does in the movies rather than cower before this little bully. I think the individuals such as Bal Thackeray or bin Laden are not as big a problem as the ideology they preach and the inspired followers they have. There have instances in history where a narrow band of fanatics has prevailed over a tolerant, peaceful majority that is not vigilant. Spain and the Spanish inquisition present an example. Iran is another example. Comparing Bal Thackeray with Bin Laden. That's a tall order! Oh, I got it, your broader point might be that "Hindus" have the same problem that "Muslims" do and fanatics are everywhere etc etc. Do we have to kill 3000 americans(200 hindus included in 9/11) to prove that we are as good as muslim extremists in mass murder. If you see the the past few years, the senior Thackeray has almost retired. His son Uddhav holds the reins. He is a moderate with a different approach. The anointment of son Uddhav came at the expense of sidelining nephew Raj, who then split to start his own political outfit. A resounding defeat in Mumbai civic elections meant Raj had to resort to other means to stay relevant. All this "sabre rattling" is part of that strategy. The joke is - nobody takes him seriously and I guess that hurts. You must also not forget that with 130 seats, BJP is the second largest party in Parliament and represents a sizeable chunk of the population. In our democracy we have to accept this with grace, however, unpleasant it is to people with a different or no ideology. Are you saying that the ideology of hate has a religion? Does the value of human life depend on nationality? Are the victims of hate in India less important than the victims of hate in the US, or anywhere else? Just think about it. Good job Riaz. Watch out, you're about to face an onslaught from Hindutva commenters, i.e. radical, Hindu IT workers in the U.S. and elsewhere who have too much time on their hands. Indians engage in self-mastabatory talk about how great their country is. They look up at the hi-rise towers of Mumbai and fail to see the dirt poor on the ground. Look at how they went crazy over that kid that won the gold medal in shooting. China's won so many individual gold medals, India went crazy over its first. So tacky, so petty. Thanks for bringing them down to earth. Hindutva is a disease afflicting India. ^^Well about the hype about the single gold medal..its a deserved hype coz its the first time for india to win gold for individual event...may be not a big deal for others..but it matters to india..which is not a sporting country. Its very generalizing to paint all patriotic commentators as "Hinduvta" without even understanding the scope and depth of what that means. Besides, Hinduvta(integral humanism + cultural nationalism) is not a equal and opposite to "Taliban/sharia" type thing..where other religion ppl have to wear yellow bands..like nazis did to jews..(far from it..). If you care the RSS/BJP guys' computer network across the country is one of the most sophisticated of its kind..sort of a network-centric warfare type..for their decision making. So even if they are going to again win the election..nothing similar to closing down video shops or stopping women from educating is gonna happen. It will be business as usual.They have great policies like Uniform Civil Code,strong counter-terror policies etc on par with that of Western countries.